"This recipe was given to me by a friend a couple years ago. When I made a batch, my husband couldn't figure out what was different about them - it's the cinnamon graham that gives them that special taste." In a large bowl, cream butter, sugar and brown sugar until fluffy. Add eggs and vanilla and beat until smooth. In another bowl, mix flour, baking soda, baking powder and salt. Add dry ingredients to creamed mixture and stir until it becomes a soft dough. Stir in oats, chocolate chips, pecans, and 1 cup of graham cracker crumbs. 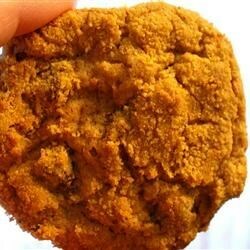 Drop teaspoonfuls of dough into remaining graham cracker crumbs and coat well. Place on a lightly greased baking sheet and bake at 350 degrees F (175 degrees C) for 10-13 minutes or until lightly browned. Cool on wire rack and store in airtight container. So good, especially right out of the oven. Make sure not to cover them until they are completely cooled. They become soggy if you don't. I liked the crunchiness and flavor. I made the mistake of following advise on cutting to half the choc chips... DON'T! We thought these were really good, but would have liked a little more cinnamon flavor. Next time, I think I'll add some cinnamon to kick up that flavor in the mix.